The dipolar interaction between two paramagnetic centres depends upon their spin–spin distance and relative orientation. Generally most experiments are carried out under conditions where the DEER signal only reports on the spin–spin distances and, for this type of data, sophisticated analysis methods for obtaining distance distributions have been developed. Recently there have been an increasing number of studies on systems where the DEER signals depend upon both distance and spin pair orientation. These investigations have relied on the use of rigid spin labels (those with a well-defined spatial position) and/or spectrometers operating at Q-band frequencies and above capable of performing DEER experiments with high resolution and sensitivity. In this article we discuss in detail orientation-selective DEER experiments for which the modulation depth and the dipolar frequencies depend on the relative orientation of the two paramagnetic centres and the distance. 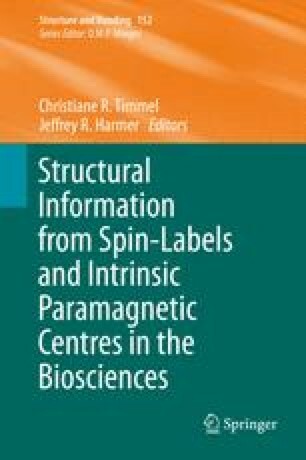 Analysis of the data in the presence of distance and orientation distributions is discussed, and representative examples from the literature are given for systems containing spin labels, organic cofactors, metals, and metal clusters. Numerical implementation of the theory is straightforward on a computer. A useful example is given in  where a calculation to determine the lower distance limit of applicability of the DEER sequence due to the bandwidth of rectangular mw pulses was presented.